Confirm this happens on Xbox as well. Moment the war table is touched, the game freezes, then crashes. the game crashes all the time for my system and my brothers all the time ps4. especially when he joins mine for co-op or when we back out of lobby and it tries to throw us be into the stupid lagging town where people are spamming towers and spells, instead of throwing us back to where we were and where we want to be our private non-lagging tavern. that and since the update the colors or items are all screwy greens sometimes org, pinks blue, blues org, etc. Also confirming random game crashes no matter what we are doing. My friends and I recently found this game and have been experiencing this problem as well. It's very annoying and I have no idea how to fix it. I had this issue when my friend and I were in a private tavern (he is the party leader), then we start and complete a mission. (He has summary disabled for some reason) I press return to tavern. I returned to the tarvern then waited for my friend to return to the tavern via the 90 seconds after a match. Game tells him he is not the party leader. I use the war table because we think I am the new party leader, (yet we don't know why he is not the party leader) so I use the wartable and WHAM, game crash. The error log tells me a file is missing afterward. Can confirm this is still happening on Xbox. Sometimes I can go a night without a crash, other nights it happens a few times. I was at a shop screen recently when it happened. I will provide more details the next time it happens. O jogo congela e fecha quando: retorno de uma partida para a torre, quando estou na torre e estou arrumando o meu inventario para vender e organizar meus itens. - o jogo congela e fecha quando: Eu retorno de uma partida para a torre, quando estou na torre e estou arrumando meu inventário para vender ou organizar meus itens. My game always crash when end map. 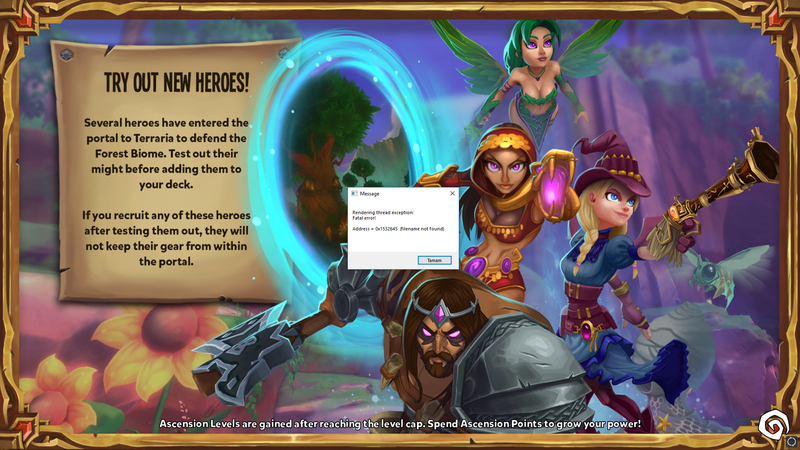 Select replay or random map, after crash the game with one FATAL ERROR. How can i upload a image? Every time I attempt to start any activity away from the public area or private tavern whether it be war table or to go to a private tavern the game will crash, 100% of the time making the game unplayable. Random Crash´s. Mostly when i´ll be back in Town after dungeon clear. Game crashes for me when loading town and sometimes after pressing E on war table. my message: "Rendering thread exception: Fatal error! Address = 0xbb0ce5 (Filename not found)"
When I go back to tavern from completed dungeon, game highly crush.